Those of you that know me, know that I am a dog lover. We have two adorable labs that we spoil rotten. 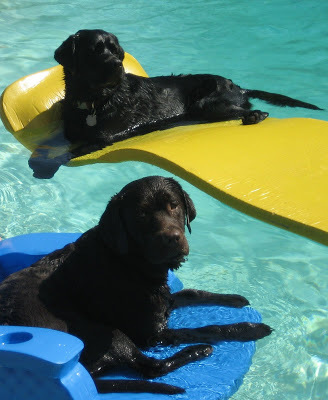 As you can see in this photo, they live the Life of Riley (whoever that is) and enjoy lounging in the pool during the summer heat. Well today I read a blurb about something called “Ice Lick”. When I saw it I thought wow what a great idea. My dogs get so hot hanging out in the yard or even when they are at the pool. That’s why they go lounging on the rafts. Why should they be any different than us? When it’s scalding out with 90% humidity I love an ice cold glass of water, tea or lemonade. 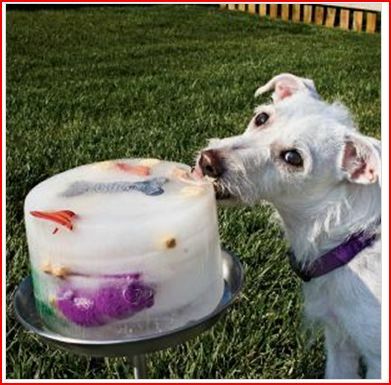 Ice Lick is just that, in my opinion, for dogs. You all may think I’m nuts but I think it’s a great idea. It’s an ice cold treat for our beloved friends. Check it out. That’s my food blog today for dogs!